Top 10 Arduino library authors @arduino @arduinolibs #arduino « Adafruit Industries – Makers, hackers, artists, designers and engineers! Over 8 years ago I wrote an article about Arduino for Make: Magazine, later Adafruit manufactured Arduino’s in the USA for awhile when Arduino was 2 separate companies (we only worked with Arduino.cc) – during that entire time Adafruit has been one of the most active authors of Arduino libraries and still is to this day. It’s been about 10 years of writing, testing, and releasing open-source code for Arduino. 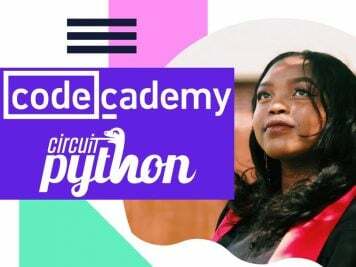 Adafruit will be doing an Arduino day event Saturday March 16th at 8pm ET. Leading up to that, I wanted to see if there was a way to know which libraries of ours are used the most. Turns out, there does not seem to be a way to know the number of downloads of a library. I emailed the Arduino developer list, I’ll post any updates if there are any. 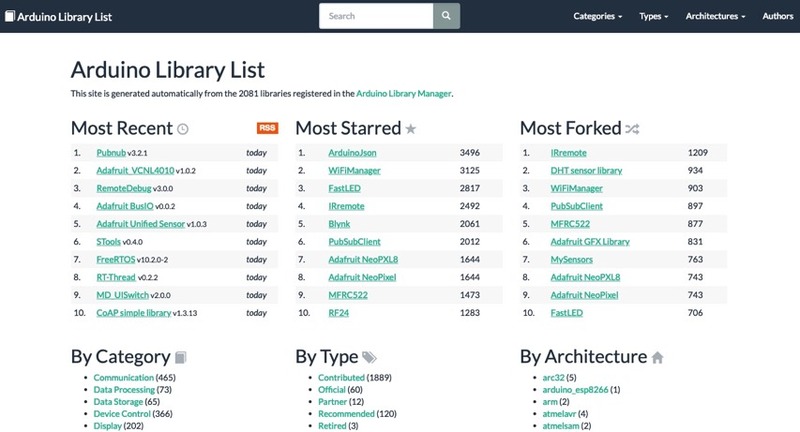 What you can find out are things like the total number of authors, libraries they have, and a few more things – the site arduinolibraries.info displays what is available (GitHub here). The are a total of 2,081 libraries and 864 authors. I poked around the JSON file and saw that the libraries are stored on Arduino’s servers, for example here’s one ours – Adafruit_NeoMatrix-1.0.0.zip, so that means there are some logs or stats somewhere that could also be displayed for the developers and community to know which libraries are downloaded the most, and which ones to make sure are updated and worked on if they are popular. 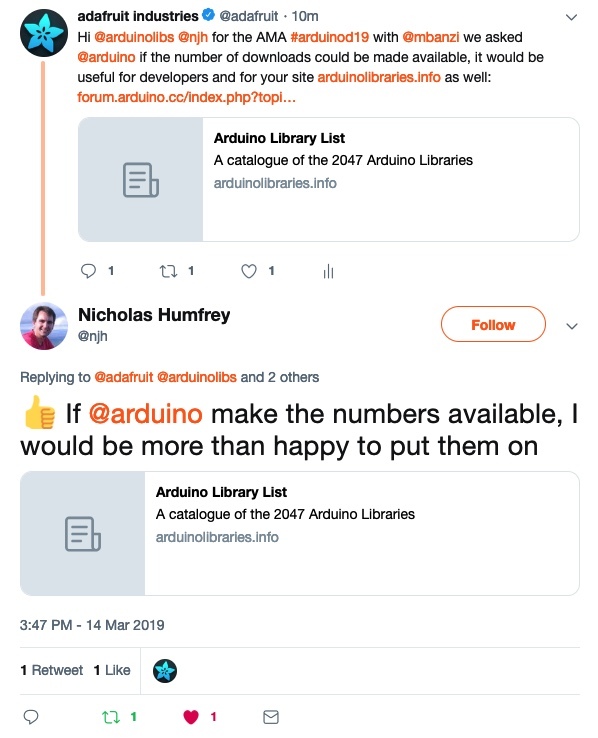 The creator of https://www.arduinolibraries.info/ is also willing to add them to the site as well. Update: 3/15/19 platform.io has the number of downloads, more details here via Twitter.